Wear this Under Armour Verve Fleece 1/2 Zip to stay warm and comfortable during any Denison University event. The screen print of an interlocking DU Logo on the front chest stands out and shows everyone who you're loyal to. The super-soft fabric delivers stretch and incredible next -to-skin comfort. 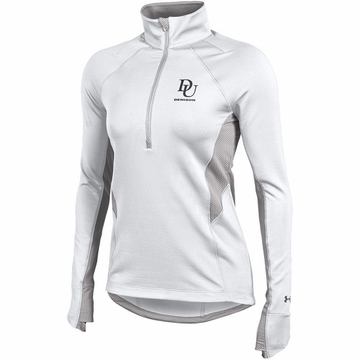 Comfortable 1/2 zip front for extra coverage and on-demand ventilation. Thumbholes keep sleeves secure and help seal in your body heat. Drop tail ensures extra coverage.